Welcome to Maine. If you've been following my twitter updates over on the right, you'll know a little bit of what we've been up to. Yesterday, mostly, I searched for painted trilliums. I spent a few hours going through the various habitats and completely struck out. It wasn't until we loaded Weston into the stroller, covered it with a bug net, and rolled him down the back driveway, that I finally found my quarry. Only three flowering plants, but isn't this species stunning? Their range just barely nips extreme northeast Ohio. I've looked for them several times up in that region, but have struck out each time. Today, finally, I saw and photographed this beautiful trillium for the first time. 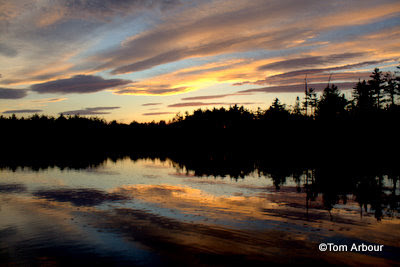 Although the bugs were crazy, and I had to wear a head net the whole time, photographing the sunset at Little Pond is always one of my favorite things to do here. Last night's show did not disappoint. And Pink Lady Slippers too? Yes, I surely wasn't expecting to find this species in full bloom, surely not at the same time as painted trillium, but here in Maine, the phenology seems to be compressed compared to our long springs in Ohio. I just happened to notice two beautiful slippers in the dim light as I was heading back up to the house, and captured this image with flash. More today hopefully with natural light. So much to see here, so much to photograph. I love that first photo - is that a painted trillium? Pretty flower and great shot. 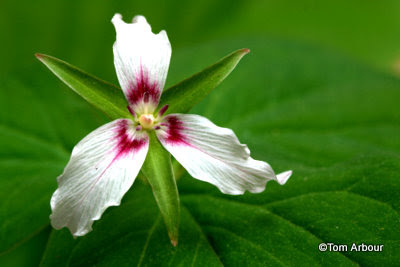 Your trillium photo is lovely! I found one this week in the Adirondacks, hiking three miles through black flies and tumbling down a rocky bank to revisit its site I remembered from previous years. (Wildflower nerds are nuts!) I've discovered that it doesn't always recur in the same spot, but this time I got lucky. 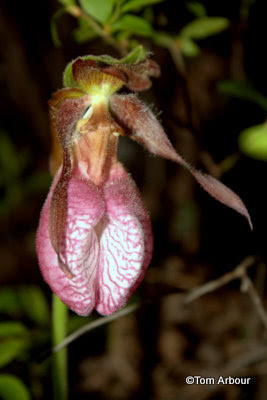 Now to find a Showy Lady's Slipper -- that would be the Holy Grail of wildflower finds. Thanks for sharing your discoveries in that wonderful state above. Beautiful work Tom. especially love the Trillium, well done ! !